John Berg (A'53) is having a well-deserved moment. 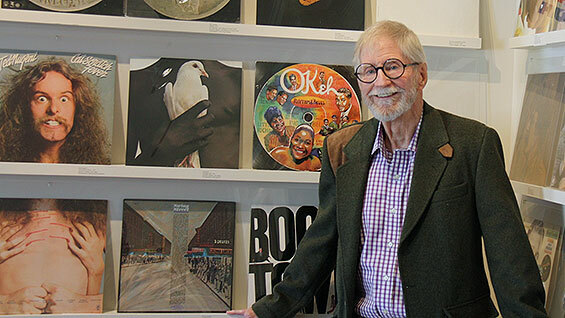 Between 1961 and 1985 as Columbia Records' Art Director, then Creative Director and eventually Vice President, Berg, who turns 81 this month, designed or oversaw some of the most iconic LP sleeves of the analog recording era. However, in spite of achieving the pinnacles of pop-culture exposure, his work rarely gets associated with his name. Now Columbia has celebrated its 125th anniversary with a new book, 360 Sound: the Columbia Records Story, featuring examples of Berg's work. And to top it off, Berg has a hit gallery show, extended due to popular demand, through February 24, at Guild Hall, in East Hampton, Long Island. At Guild Hall, and in almost any LP bin anywhere, you can see many of John Berg's best-known works in their original format. You likely know many of them from memory. Can you picture the cover to Bob Dylan's Greatest Hits, with his backlit profile, which originally included a now equally famous poster by Milton Glaser (A'51) commissioned by Berg? How about Chicago's "chocolate bar" gatefold LP (a Grammy design winner; one of four in Berg's career)? Bruce Springsteen's Born to Run? Even if these covers don't immediately spring to mind a visit to the gallery will likely have you saying repeatedly, "he did that one too?" Reached by phone at his home in East Hampton, John Berg recalled his days at Cooper Union. "I loved it," Berg says. Inspired by friends who had attended the art school before him, Berg cheekily says, "I would have gotten in anyplace. I was pretty good. I was a cartoonist at my high school newspaper. Attending Cooper was a natural extension of growing up in Flatbush Brooklyn." Art Director for the yearbook, Berg also worked on the student newspaper, The Pioneer. He graduated in 1953 with the certificate awarded at the time. In 1976 received a Bachelor of Fine Arts degree awarded to certificate-holders based on external courses, professional accomplishment, life experience or two or more in combination. John Berg also received the St. Gauden's medal in 1985. His start at Columbia Records is a lesson in luck and shoeleather. "My wife was pregnant and I was out of work. I just dropped my portfolio off for freelance consideration and got hired on the spot as Art Director. It was a place of great interest to me and everybody else in the graphics dodge," Berg says. Part of the interest was the diversity of Columbia's artists, from classical to folk, jazz and rock/pop. "Columbia was much bigger in scope than other record companies except for RCA," Berg says. His work covered every musical genre and reflects the eclecticism of their catalog. "I don't have a style because if I did have a style all the stuff would look alike. One thing doesn't look like the other," Berg says, "I just did what I liked." We asked John Berg to comment on some of his most famous LP designs, along with some less well known that we just liked. His recollections are a music-lover's treasure trove of trivia and insight into the personalities that made the music. Bob Dylan Greatest Hits Dylan hadn't had any product out in while. So we decided that it would be nice for the consumer to give them a little bonus. It was the first time a poster was ever enclosed in an album. I picked Glaser because he had a big reputation as a poster artist. Big Brother and the Holding Company Cheap Thrills My boss was working on the premier album art and so was Janis Joplin and so was I. We couldn't agree on a treatment. Everybody hated everything. Finally Janis went off and hired R. Crumb and he did it for her. She brought it into my office and laid it on my desk and I loved it. Our boss, the president of the company, hated it. I told him, "You can hate it all you want but this is it." Ramsey Lewis Salongo. Ramsey Lewis was a sweet guy. He loved our input. We scheduled a shoot with a really hot photographer named Norman Seeff. On the day of the shoot Ramsey Lewis calls up and says he's had an accident. He fell off the stage the night before and knocked all his teeth loose. He had braces on his teeth. He asked if we still wanted to do it. I said, "It looks great. Smile." [laughs] During the shoot Norman got on the phone with me and said "these teeth look horrendous." So I said, "Let's paint him!" Later, when it came time to title the album I wanted to call it "Colored," which is stepping out a little far for a black artist. Ramsey loved it and wanted it too. But Columbia Records management hated it. They didn't want any part of that kind of thing. "Salongo" means something but I have no idea what. Maybe "accident." The Cleveland Orchestra George Szell Conducts Beethoven. [Laughs ruefully] George Szell is a case in point. He was difficult. He doesn't have any qualifications to have a taste in typography but exercised it [on a previous LP] because he is the "maestro." After the fact, his producer told me that Szell had called me a "flaxen-haired [unprintable]" in a conversation they had. So after Szell died we were doing a re-release of the Beethoven Fifth Symphony. What you do when you are working on dead people is go through the files and see what you got. And lucky me I found this picture. Getting even was right up there with selling the LP. And I got even. It looks like he is blocking his face but to me it says "Five." Loverboy Get Lucky. I commissioned the photograph. I wanted to pump as much color into the cover as I could. We found the best pair of red leather pants but they didn't fit any models. The photographer, named David Kennedy, had a 16-year-old daughter. They fit her perfectly. Then we got an Argentinian male model, 6 foot 5, and hired him on the basis of his big hands. Santana Greatest Hits. That photo, by Joel Baldwin, was hanging on one of my designer's walls. I always admired it but had no use for it until I got this panic call from a meeting being held upstairs. "Can you possibly come up with a cover for Santana's Greatest Hits by tomorrow?" The design department were miracle workers but a cover by tomorrow? But I said, "sure!" I went downstairs, got the thing off the wall, brought it up and said, "How do you like that?" And they said, "That's great!" No type on the cover. We put the type on a sticker. Bruce Springsteen and the E Street Band Born to Run. Bruce Springsteen and Eric Meola, the photographer, came up unannounced one day with pictures from a photo session they had done on their own. Springsteen wanted to use a picture that looked like what John Updike used on the back of his books. I hated that kind of stuff. We already had one of those [The Wild, the Innocent and the E Street Shuffle] and we managed to mess with the type so that it was acceptable to me. I said, "leave me all the contact sheets." One of my unfailing good traits is I will actually look at your pictures. All of them. I mean relentlessly. I will find stuff the photographer never knew was there. Among the photos there were three or four shots, all more or less the same. But in this one they were just breaking up, or whatever the emotion was. It was perfect. It oozes charm. So I told to Springsteen and Meola that I wanted to use it as fold-out cover. I said, "Now I gotta try and sell this thing upstairs to management because the cost is twice as much to print a gatefold." The product manager came down and said, "We love it!" But I cooked all that up. What I was doing was I selling Springsteen the idea to avoid having another John Updike cover.